KrellTech, a leader in the manufacturing and sales of fiber optic polishing and inspection equipment, announced recently the release of a new product in its line of connector polishers, the FLex System. Ideally suited for use in R & D laboratory applications where adaptability is key, the Flex is designed for cost-effective processing of waveguides, PLCs, optical chips, and fiber arrays. While offering a flexible processing platform, it still offers a number of features that ensure the same quality of end product typical of KrellTech’s line. Components can be polished with either flat or angled edges and the polished surface geometry is tightly controlled by KrellTech’s patented independent suspension and optically aligned workholder mechanism. FLex’s microfeed feature automatically lowers the waveguide to the polishing surface at a controlled rate for accurate stock removal, minimizing potential breakage. “The FLex system was designed for clients who had been customizing their own solutions, but were still not meeting their needs for adaptability and accuracy,” said Al Cheswick, VP of Sales at KrellTech. “So we built it to support a variety of component dimensions and a variety of angles, auto feed function, in-line video inspection and some user-definable features. It is a viable stepping stone to our Scepter system used in higher volume production environments,” he added. The FLex System can support processing of two components simultaneously and custom holding fixtures are available for specialized applications. Despite offering a full feature set, Flex has a small footprint, making it perfect for laboratory benchtops and does not require pneumatic or hydraulic utilities. 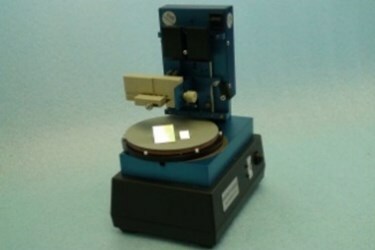 KrellTech manufactures advanced polishing systems and equipment for processing photonic components in markets ranging from telecom/datacom to industrial, and bio-medical to avionics. Our innovative approach to optical processing incorporates polishing with in-line inspection techniques for immediate quality feedback, reduced material handling and increased throughput.Krell’s experience spans all termination disciplines for bare fiber, connectors and waveguides, addressing application requirements from high volume production to the stringent demands of harsh environment industrial and aerospace. The company works closely with customers from concept to process development through implementation, resulting in products that comply and exceed industry standards including Telcordia and rigorous Mil-specs. For more information, visit www.krelltech.com.